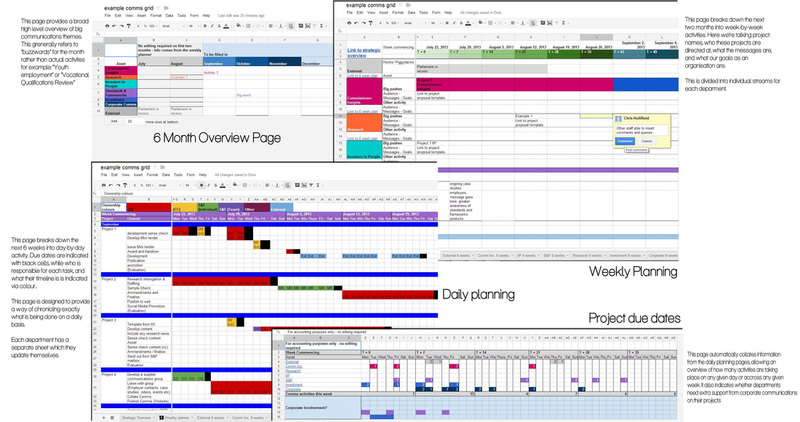 When I first arrived at UKCES weekly pan-organisational communications meetings were based on a six month Excel communications grid that was updated by one sole member of the corporate communications team. This meant that the rest of the team felt removed from the planning process, and often communications discussion in such meetings was high-level rather than focusing on what actual communications activities people were undertaking. There was also no discussion of communications evaluation. There was therefore an urgent need to provide a more integrated method to plan communications in a way that would encompass more people. As part of the solution to this, I developed a new system, that in addition to a high-level 6 month “broad theme” overview, also included a tab for weekly “big communications pushes” across the organisation, and daily planners for each department, allowing them to structure their planning of communications activities more clearly and drill down from broad overarching themes all the way to daily activity. The new design was cloud-based, which meant that the document was live online and editable by multiple users simultaneously. We went from being in a situation where one person in the organisation was responsible for comms planning, to one where all comms team members were empowered to participate in the planning process. Qualitatively, for the first time the organisation was able to look at communications activities day by day and week by week in an effective manner. This has improved project delivery, and reduced the number of last-minute panics. Including more people in the communications planning also meant there was a greater awareness within the team of what activities were being carried out and when. Quantitatively, it meant that communications planning moved from being handled by only one person to 44, which reduced workload and made communications planning more accurate. We can also share various versions of this comms grid with external contractors without revealing it in its entirety, which ensures better external project planning without compromising confidentiality.